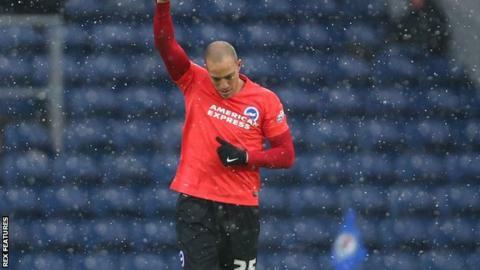 Bobby Zamora scored on his 35th birthday to give Brighton victory at Blackburn Rovers and their first Championship win in eight games. Zamora tapped the visitors into a third-minute lead at Ewood Park after Jamie Murphy's shot hit the post. Shortly after the break, Blackburn's Ben Marshall curled a free-kick against the inside of the upright. Anthony Knockaert also struck the woodwork for the Seagulls as they won for the first time since 5 December. The win moved Brighton back into the play-off places after they had slipped to seventh following Sheffield Wednesday's victory over Leeds in the lunchtime kick-off. Zamora's strike halted a dramatic decline for Albion who, after going unbeaten for the opening 21 matches of the season, had not won since beating Charlton six weeks ago and had gone five league games without a goal. The big striker was instrumental throughout a wintry afternoon in the north west, seeing another shot saved by Jason Steele and lifting the ball just wide of Steele's right-hand post. Blackburn's Jordan Rhodes, who had scored three goals in his last three home games against Brighton, failed to make an impact as his best effort struck the side netting. Rovers are now without a win in six games and remain 18th, while Brighton move up to fifth. "When a goal goes in against us, it rocks us a bit and it shouldn't because we have so much time to retrieve the situation. "First half we started okay and with their first attack they scored. For 20 minutes after that we played too slow, passing the ball backwards and I don't want to see that type of football. I want to go forward. Second half was more up and at them. "For this club to improve and to have any chance, we have to be a lot better as a group and a team." "It's a big win for us today and we needed it, probably on the back of our most disappointing result against Rotherham. "Apart from that, I can't fault the players' application. Some of the games we've lost, I didn't think we deserved to lose. But that's the Championship. "What we did see is a really good reaction from Tuesday night." Match ends, Blackburn Rovers 0, Brighton and Hove Albion 1. Second Half ends, Blackburn Rovers 0, Brighton and Hove Albion 1. Thomas Spurr (Blackburn Rovers) is shown the yellow card for a bad foul. Foul by Thomas Spurr (Blackburn Rovers). Substitution, Brighton and Hove Albion. Andrew Crofts replaces Jamie Murphy. Attempt saved. Jordan Rhodes (Blackburn Rovers) left footed shot from the centre of the box is saved in the bottom right corner. Assisted by Thomas Spurr with a cross. Attempt blocked. Simeon Jackson (Blackburn Rovers) right footed shot from outside the box is blocked. Assisted by Hope Akpan. Substitution, Brighton and Hove Albion. Íñigo Calderón replaces Anthony Knockaert. Jordan Rhodes (Blackburn Rovers) wins a free kick in the attacking half. Attempt missed. Tom Lawrence (Blackburn Rovers) right footed shot from outside the box is high and wide to the right. Assisted by Hope Akpan. Substitution, Blackburn Rovers. Simeon Jackson replaces Darragh Lenihan. Attempt missed. Jordan Rhodes (Blackburn Rovers) header from the centre of the box is just a bit too high. Assisted by Tom Lawrence with a cross following a set piece situation. Chris Brown (Blackburn Rovers) wins a free kick on the left wing. Attempt blocked. Ben Marshall (Blackburn Rovers) right footed shot from the centre of the box is blocked. Corner, Blackburn Rovers. Conceded by Liam Ridgewell. Attempt blocked. Jordan Rhodes (Blackburn Rovers) right footed shot from the left side of the box is blocked. Assisted by Hope Akpan. Substitution, Blackburn Rovers. Adam Henley replaces Craig Conway. Substitution, Brighton and Hove Albion. James Wilson replaces Bobby Zamora. Attempt blocked. Hope Akpan (Blackburn Rovers) left footed shot from the right side of the box is blocked. Foul by Jordan Rhodes (Blackburn Rovers). Liam Ridgewell (Brighton and Hove Albion) wins a free kick in the defensive half. Craig Conway (Blackburn Rovers) wins a free kick in the attacking half. Foul by Jamie Murphy (Brighton and Hove Albion). Attempt saved. Craig Conway (Blackburn Rovers) right footed shot from the centre of the box is saved in the top centre of the goal. Substitution, Blackburn Rovers. Tom Lawrence replaces Elliott Bennett. Anthony Knockaert (Brighton and Hove Albion) hits the left post with a right footed shot from the centre of the box. Assisted by Liam Ridgewell with a cross. Attempt blocked. Jamie Murphy (Brighton and Hove Albion) right footed shot from outside the box is blocked. Assisted by Bruno. Corner, Blackburn Rovers. Conceded by Lewis Dunk. Corner, Blackburn Rovers. Conceded by David Stockdale. Ben Marshall (Blackburn Rovers) hits the right post with a right footed shot from outside the box from a direct free kick. Liam Ridgewell (Brighton and Hove Albion) is shown the yellow card for a bad foul. Foul by Liam Ridgewell (Brighton and Hove Albion).